With many types of well-featured washing machines in the market, the Frigidaire FWS933F dares to be different. This washing machine is best described as simple and convenient to use, as it provides just a good amount of features in a basic and familiar design. Though the limited features could be a disappointment for some, this washer can still offer a tough performance when it comes to thorough washing. The Frigidaire FWS933F is a top-loading washing machine that measures 27” in width, 43 and 5/8” in height, and 27” in depth. With a volume capacity of 3 cubic feet, the FWS933F has enough space to handle most laundering needs. Also, the large capacity of this washer means that users can save on electricity and water by running fewer but larger loads, instead of running numerous washes with smaller loads. As a top-loading washing machine with simple dial controls, the Frigidaire FWS933F has a basic design that is very similar to older washing machines. Although this washer is similar to traditional washing machines, it has a number of features and technologies that sets it apart from old washers. The Frigidaire FWS933F is designed to provide users with a dependable washing machine that will last for years. The Titan 25 Wash Tub is made to offer a lifetime of performance, which is why it is made completely out of recyclable material. This means that the drum can be recycled and reused for other purposes when there is no more use for the machine. The FWS933F makes use of the Frigidaire-patented Sure-Spin Suspension System to ensure that the clothes get a complete and thorough wash. Basically, this suspension system is meant to allow for an optimal spinning motion, minimizing stopping and walking. This washing machine also has a self-cleaning lint feature, which translates to less work for the users. In effect, users can get cleaner clothes with less effort on their part. One of the most handy features on the Frigidaire FWS933F is the Variable Water Level Control. With a simple turn of the water level control knob, users can adjust the amount of water that the washer uses. This washer has three water level adjustments available. Not only does this allow for better control over the wash cycles, but it also helps conserve water and save on water bills. Perhaps the biggest advantage of the Frigidaire FWS933F is its simple and basic design. With only three dials, users can control the spin speed, water level, wash cycle, and temperature controls. The simple design of the washer allows anyoneto set the washing machine easily and quickly, two qualities that are important, especially if one is planning on teaching the kids to operate the washer. Another advantage of this washing machine is the numerous options it offers to consumer for the setting the perfect wash cycle. Consumers have noted how using a total of nine cycles, three wash and rinse temperature combinations, two agitate and spin speed combinations, and three water level adjustments really helped in coming up with a more thorough wash. They can easily find the right settings for any type of load. The Frigidaire FWS933F is also a great choice because of its low price point. Many of the washers in the market these days can cost more than $1,000, a heavy price tag that can a drill a hole into the bank account. The FWS933F is priced about $500 from numerous distributors and retailers. The biggest disadvantage to consumers is that is the fact that the Frigidaire FWS933F it is a top-loading washer. Front-loading washers are specifically designed to conserve energy and water. Although the FWS933F has a water level control, it still uses a considerably larger amount of water than front-loading washers. The FWS933F is also not stackable, unlike front-loading washers that are known to be space-savers. Another disadvantage of the Frigidaire FWS933F is its limited number of cycle options. While this model does have enough cycle options to satisfy most washing needs, some consumers want a model with more settings and options to play around with. The Frigidaire FWS933F is a capable washer with a decent number of settings, options, and features. Those who are looking for a washer with a small price tag will probably be happy with this washing machine from Frigidaire. While this washing machine doesn't have as many features as some of the higher models out there, it can handle most washing machine tasks. Can you soak clothes in this washer? Can you add clothes once the cycle has begun? I love this washer! Having purchased it approximately a year ago, if I had to do it all over again, I would purchase the same washer. Not only does the washer run smooth, but it is also quiet. Ease of loading and unloading, even though it is a super capacity, I believe the capacity comes in because it is somewhat wider, but not as deep as some. I'm short, so if you've ever tried to reach to the bottom of some of those super capacity washers, it's as if sometimes you feel like you are going in head first. Although it seems wider, it's as if it is designed in a way that saves space, whereas I have no problems fitting this washing machine and the matching dryer in a small laundry closet in the duplex we currently live in. That is not the case with this item. I love the cycle choices, and it does an awesome job on the clothes. This particular washing machine is energy efficient and for me, it just the right size, height and has just the right features for a mother of 3 teens! Clothes come out clean, fresh and another positive aspect is the fact that it does a terrific job in spinning the water out, which makes the job easier on my dryer. All of the cycles are efficient and function properly. This particular item definitely has more pro's than con's. No doubt about it. Compared to prior brands I have used, I would highly recommend this washing machine to anyone in order to meet their laundry needs. I generally do most of the laundry in the household, plus work approximately 60 hours per week, but on occasion, I manage to talk my 17 year old daughter into helping me when she's home. She doesn't seem to mind too terribly bad because she says it kind of makes her feel good to know that laundry is basically easy and she's helping out some. 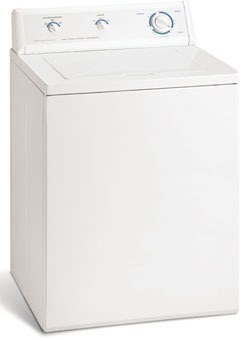 This machine is tough, quiet, holds plenty of clothes and does a great job overall! I don't begrudge my purchase of this machine at all. From the choices I had, I'm glad this is the one choice I made. I feel it was one of the best I could have made.